The shoulder is the most movable joint in the human body. A group of four muscles and their tendons, called the rotator cuff, give the shoulder its wide range of motion. Swelling, damage, or bone changes around the rotator cuff can cause shoulder pain. You may have pain when lifting the arm above your head or moving it forward or behind your back. The most common cause of shoulder pain occurs when rotator cuff tendons become trapped under the bony area in the shoulder. The tendons become inflamed or damaged. 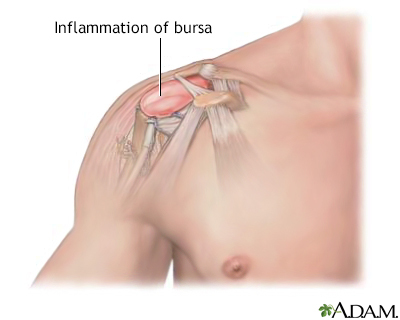 This condition is called rotator cuff tendinitis or bursitis. Sometimes, shoulder pain may be due to a problem in another area of the body, such as the neck or lungs. This is called referred pain. There is usually pain at rest and no worsening of pain when moving the shoulder. Put ice on the shoulder area for 15 minutes, then leave it off for 15 minutes. Do this 3 to 4 times a day for 2 to 3 days. Wrap the ice in cloth. Do not put ice directly on the skin because this can result in frostbite. Rest your shoulder for the next few days. Slowly return to your regular activities. A physical therapist can help you do this safely. Taking ibuprofen or acetaminophen (such as Tylenol) may help reduce inflammation and pain. Rotator cuff problems can be treated at home also. If you have had shoulder pain before, use ice and ibuprofen after exercising. Learn exercises to stretch and strengthen your rotator cuff tendons and shoulder muscles. A doctor or physical therapist can recommend such exercises. If you are recovering from tendinitis, continue to do range-of-motion exercises to avoid frozen shoulder. Practice good posture to keep your shoulder muscles and tendons in their right positions. 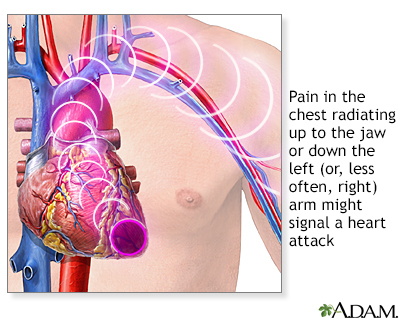 Sudden left shoulder pain can sometimes be a sign of a heart attack. Call 911 if you have sudden pressure or crushing pain in your shoulder, especially if the pain runs from your chest to the left jaw, arm or neck, or occurs with shortness of breath, dizziness, or sweating. Go to the hospital emergency room if you have just had a severe injury and your shoulder is very painful, swollen, bruised, or bleeding. Your provider will perform a physical exam and closely look at your shoulder. You will be asked questions to help the provider understand your shoulder problem. Blood or imaging tests, such as x-rays or MRI, may be ordered to help diagnose the problem. If you have a rotator cuff problem, your provider will likely suggest self-care measures and exercises. Matzkin EG, Hampton DM, Gill TA. Shoulder diagnosis and decision making. In: Miller MD, Thompson SR, eds. DeLee and Drez's Orthopaedic Sports Medicine: Principles and Practice. 4th ed. Philadelphia, PA: Elsevier Saunders; 2015:chap 43.